Degrees and related programmes are defined in the New Zealand Qualifications Framework. maintain approval and accreditation to provide a programme of study leading to a qualification listed on the NZQF. The regulatory authority for NZQA Rules is under section 253 of the Education Act 1989 (the Act). Approval and accreditation is required under sections 249 and 250 of the Act. Section 253(B) part (3) of the Act requires that the award of a degree must recognise the completion of a programme of advanced learning that is “taught mainly by people engaged in research”. The type of research people engage in will be relevant to the nature of the degree. A professional or applied degree may have a greater focus on applied research, while a theory-based degree could result in more theoretical, strategic and scholarship type of research. Each TEO has the responsibility for demonstrating how its graduates will meet qualification requirements and outcomes through a programme of study. A TEO can show this through its self-assessment processes. TEOs can choose to have a degree or related qualification evaluated through the Te Hono o te Kahurangi Framework. If a TEO chooses this, the application (s) will be evaluated by the Quality Assurance Maori team. Each education organisation has the responsibility for demonstrating how graduates will meet qualification requirements and outcomes through a programme of study, through the organisation’s Whare Whakairi Kōrero framework. For more information see Te Hono o Te Kahurangi quality assurance. The decision to approve a programme of study leading to a degree or related qualification, or to accredit a TEO, is based on the quality and sufficiency of evidence provided in an application. The application should meet criteria set out in part 4 of the NZQF Qualification Listing and Operational Rules 2016, and parts 1 and 2 of the NZQF Programme Approval and Accreditation Rules 2018. How well does the qualification and programme meet the stated purpose and outcome? NZQA reviews the information and the evidence provided in the application. Rubric one (below) sets out the expected levels of performance in relation to the evaluation question. makes sense in the context of the question. Good evidence that there is a distinct need for the qualification and programme. Good evidence that the qualification and programme purpose and outcomes meet the evidenced need. No significant gaps or weaknesses in the qualification and programme. The nature, quality and integrity of the information and evidence does not convincingly demonstrate a distinct need for the qualification and programme. Insufficient evidence that the qualification and programme purpose and outcomes meet the evidenced need. Significant gaps or weaknesses in the qualification. NZQA reviews information and evidence using rubric two. Rubric two (below) sets out the expected levels of performance in relation to the evaluation question to decide whether to accredit the TEO. Good evidence of satisfactory and appropriate research that is adequately resourced. Insufficient evidence of satisfactory and appropriate research that is adequately resourced. NZQA uses the criteria in Rule 4.1 of the NZQF Programme Approval and Accreditation Rules 2018 and the following evaluative question to determine whether an application will be approved or not. The programme meets the definition published on the NZQA website of the applicable qualification type listed in the second column of the Table in the Appendix to the NZQF Listing and Operational Rules 2016. The TEO must demonstrate that the level and credit value of the qualification to which the programme leads meets the requirements in the qualification type definitions published in the New Zealand Qualifications Framework. The graduate profile of the qualification must clearly describe what the graduate will do, be and know if they successfully complete the qualification. TEOs must demonstrate the purpose of the qualification through the graduate profile statement, as well as how the programme's aims and outcomes will be fulfilled through the subjects, delivery modes and practical components (e.g. what gives the degree programme its unique focus). The stated programme aims must be clearly defined, and be appropriate to the nature and the level of the qualification the programme leads to. The aims of the programme must clearly match the qualification’s purpose and the graduate profile statement. The qualification’s use and relevance to learners, industry and communities are clearly developed from a need for the programme. The learner group is identified and the programme clearly articulates the purpose of the programme and the qualification to which it leads. the combination of components is consistent with and supports the aims and learning outcomes of the degree programme. The delivery modes and methods are adequate and appropriate, given the stated learning outcomes for the programme. Where specific resources are necessary for the programme to be provided, those resources are clearly outlined. demonstrate consideration of cultural safety and ethical practice. It is important that the delivery methods do not place learners or the public at risk. The TEO must identify any potential risks, and demonstrate how they will be addressed. The TEO must identify and describe any practical, field-based or work-based components in the programme (including research and the supervision of research) that are based away from the stated delivery site. In the case of degree programmes with research components, the TEO must provide evidence of the level and scale of the research involved in the programme. There is a written summary of the consultation undertaken, the views expressed, and consideration of the views. The consultation and summary must cover the acceptability of the programme to the relevant communities (including whānau, hapū, iwi, or hapori Māori) and other key stakeholders (including any relevant academic, employer, industry, professional and other bodies). The TEO needs to provide evidence of consultation that considers the needs of stakeholders. This evidence must demonstrate that the TEO has appointed a designated advisory group within the specified subject area prior to or during development of the programme, and that this group has contributed to and supported the development of the programme. The advisory group should be composed primarily of external representatives of industry, academics in relevant disciplines and tangata whenua. Evidence of this should be included in the application. The application should provide evidence of the depth and breadth of consultation undertaken, the feedback received, and evidence of how feedback was used in decision making processes. normal progression within the programme. The TEO’s application must demonstrate how the provisions and procedures for the awarding of recognition of prior learning, and credit recognition and transfer, will be applied to the programme. TEOs should refer to the NZQA website for guidance on CRT and RPL. Assessment methodology is fair, valid, consistent, and appropriate given the stated learning outcomes. where appropriate, assessment policies and practices which allow learners to request assessment in te reo Māori. it provides evidence of any systems for implementing improvements as a result of moderation. TEOs must demonstrate the procedures used to ensure that the programme remains relevant and quality outcomes continue to be delivered to learners and stakeholders. The TEO needs to demonstrate that teaching staff conduct research within their area of expertise and that this research advances knowledge and/or supports the continued development of the programme and its delivery. TEOs should be able to demonstrate the link between staff research and the degree programme. NZQA uses the criteria in Rule 6 of the NZQF Programme Approval and Accreditation Rules 2018 to analyse applications for programme accreditation. The TEO has the capability and capacity to ensure assessment materials and decisions are fair, valid, consistent and appropriate, given the stated learning outcomes. that there are effective and documented systems for both internal and external moderation, pre- and post-assessment. This must include identifying external arrangements for post-assessment moderation. The TEO has the capability and capacity to support sustained delivery of the programme through appropriate academic staffing, teaching facilities, educational and physical resources, and support services. there is a commitment to provide any additional resources and facilities required for the ongoing delivery of the programme. For programmes with practical, field or work-based components, TEO must formalise the roles and responsibilities of the learner, supervisory staff from the TEO and the host and, where relevant, a registration body. In some situations, TEOs will need to demonstrate experience in Māori language and culture, appropriate knowledge, skills and tikanga Māori. learners have access to adequate and appropriate degree programme information, guidance and support systems. The TEO must demonstrate that they can support the implementation and sustained delivery of the degree programme. evidence of structured processes associated with an academic board or equivalent (with delegations to faculty or programme committees as appropriate). If the applicant TEO is not the holder of the programme approval, there is support from the holder of the programme approval. Where a TEO does not hold degree programme approval, it must demonstrate that there is a formal agreement between itself and the TEO that holds the degree programme approval. An agreement between the parties is required, and must include provision for dispute resolution, managing changes to the programme and arrangements if the programme ceases to be delivered. There must be adequate and effective review of programme performance and the TEO’s capability to support the programme. determining whether the programme should continue to be delivered. The TEO must demonstrate that the quantity and quality of research outputs of the staff teaching on the programme are monitored. The collective output must be consistent with the development and maintenance of an ongoing research culture. It is expected that there will be an appropriate balance between pedagogical and discipline-specific research, and that the collective research outputs will be appropriate to the nature of the degree programme. If the TEO is already engaged in the Performance-Based Research Fund (PBRF), its rating should be included in the application. If the TEO is not engaged in PBRF, an alternative way of measuring research output should be included with the application. The TEO must demonstrate that organisational systems and facilities provide appropriate support for teaching staff involved in research, including access to an appropriate ethics committee. TEO notifies NZQA of intent to submit application (three months prior to submission). TEO submits application to NZQA. NZQA evaluates application - pre-assessment, evaluation, draft report circulated, application outcome (approved or declined). If application is approved, the qualification is listed on the NZQF. 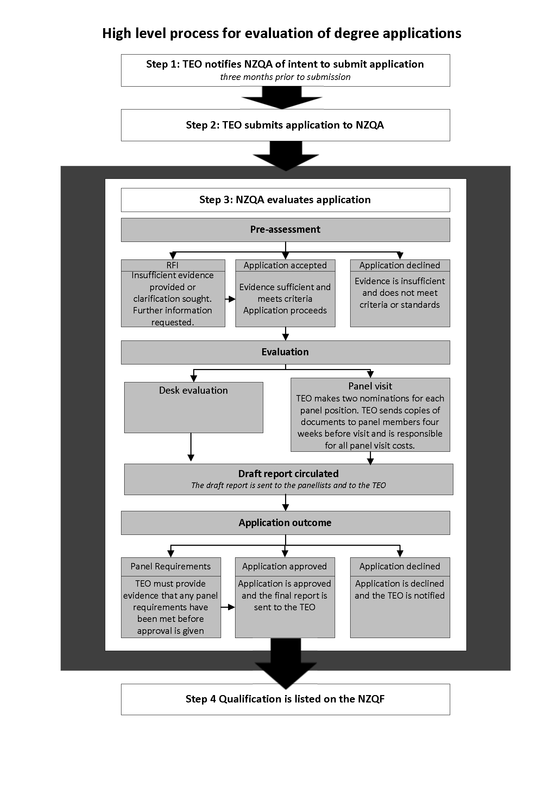 For further details, see this diagram of the high level process for evaluation of degree applications (PNG, 161KB). NZQA panels generally comprise of either five or six individuals. Where possible, Māori and Pasifika representation at a panel is combined with either the academic or industry representative. Therefore, NZQA tries to ensure that panels comprise of five individuals in total. Where it is impossible to combine Māori or Pasifika roles in the panel, a sixth panellist representing Māori or Pasifika interests will be appointed. Applications for Level 10 programmes involve a larger panel. Where TEOs are planning to apply for a Level 10 programme they should approach NZQA to discuss panel requirements prior to making an application. Applications for programmes that involve registration body approval (e.g. Nursing Council of New Zealand, Social Workers Registration Board, Education Council New Zealand) will involve panellists nominated by those bodies. Where TEOs are planning to apply for a programme that requires registration body approval they must approach NZQA to discuss panel requirements prior to making an application. Māori and, where appropriate, a representative of Pasifika or other relevant communities, who has knowledge of the discipline to which the application relates. undertake regular and comprehensive reviews of the programme to ensure that the approved programme remains relevant and current. Accredited TEOs are required to undertake a comprehensive review of a degree programme at least once every five years. This evaluation should include input from the relevant professional and academic communities. The TEO must report the findings of these reviews to NZQA. Ongoing accreditation is conditional on a TEO demonstrating that the delivery of the degree programme continues to meet relevant criteria. NZQA requires all degree programmes to be monitored annually. Following approval and accreditation of a degree programme, NZQA and the TEO will agree on who is best placed to act as the degree monitor. In many cases the degree monitor will have been involved in the panel visit. NZQA contracts an external independent degree monitor. The first monitoring visit will be undertaken after the first year of delivery. On the first visit, an NZQA representative accompanies the monitor. On a recommendation from the degree monitor, NZQA may approve a request from the TEO to move to self-monitoring. The TEO then becomes responsible for ensuring that the programme is monitored annually by an independent external monitor. The TEO will report back to NZQA on the degree programme using the yearly Annual Programme Evaluation Review (APER) process. The monitor’s report would generally be attached. For more information see the Guidelines for monitoring programmes leading to diplomas, degrees and related qualifications at levels 7 to 10, available at Diplomas, degrees and related qualifications monitoring. Structure of the degree programme. significant changes to the structure of the programme. If there are a significant number of changes made to the programme NZQA may decline the application and require a new programme approval application to be submitted. NZQA will publish details of the approved changes to the related qualification on its website. This section provides guidance on how TEOs can work together to develop and provide programmes. This includes the information required from a TEO when a collaborative application is submitted. Where TEOs collaborate to develop and or provide an approved programme, they will need to establish a formal agreement. A written formal agreement that records how the TEOs will work together to develop and/or maintain and/or provide the programme must be established. identifies clear lines of authority and areas of accountability. The information below should to be provided with an application for a joint degree programme. The following procedures have been agreed between NZQA and Universities New Zealand (UNZ). (a). If the qualification is awarded solely in the name of a university, Universities New Zealand’s Committee on University Academic Programmes (CUAP) procedures would apply, as set out in the CUAP booklet. (b). If it is awarded solely in the name of another TEO, the relevant procedures would apply, as set out in NZQA policy. (c). For a degree awarded in the name of two TEOs, one of which is a university, a combination of the procedures will apply (e.g. negotiated between the institutions). If the application involves a university and an ITP, wānanga or PTE, the applicant TEOs should submit only one set of documentation. The documentation needs to go to NZQA first. After initial evaluation, and only if it addresses all requirements, the application will be sent to CUAP by one of the due dates (see below). When NZQA receives the application, they will do an initial analysis of the documentation to ensure that the application can meet the relevant criteria. If the documentation is incomplete or not to a suitable standard, NZQA will consult with the applicant TEOs and return the documents for the required improvements or amendments through a request for further information (RFI). When the documentation has been satisfactorily amended, it should be sent to CUAP in time to fit in with CUAP cycles, i.e. by 1 May or 1 September. NZQA will attach any comments to the documentation so that they can be considered by CUAP, in the same way that comments from any university will be considered. If there are concerns, CUAP will discuss these with NZQA. When the application meets the relevant criteria, CUAP will recommend approval and notify NZQA. If CUAP does not approve the application, it will advise NZQA and applicant TEOs. The site where the programme will be delivered must be approved by NZQA as part of the accreditation to deliver the programme. This may or may not require a site visit: this will be decided when the application is submitted. If a site visit is required it may take place while the CUAP process is under way. The outcome of the accreditation visit will be reported to CUAP. the delivery of a programme. Before applying, TEOs need to determine that the application meets the relevant criteria. a written formal agreement covering any issues raised by the application and arrangements for the joint development of material, research and intellectual property ownership. A TEO can arrange for another TEO to provide approved degree programmes or part of approved degree programmes on their behalf. There are different requirements when a TEO engages a sub-contractor depending on whether the sub-contractor involved has accreditation to provide the approved degree programme (see the NZQF Programme Approval and Accreditation Rules 2018).